The phenomenon of Cuba’s ballet goes beyond the anomaly of a European, historically elitist dance form thriving in the communist state. Its provocative story lies in the first two decades of the 1959 Revolution when cultural production was linked to the moral and economic development of the new state. The state-funded Ballet Nacional de Cuba has supported the socialist ethos of the Revolution through boycotts, producing patriotic ballets, and initiating a Cuban style of ballet choreography and pedagogy taught throughout the island. 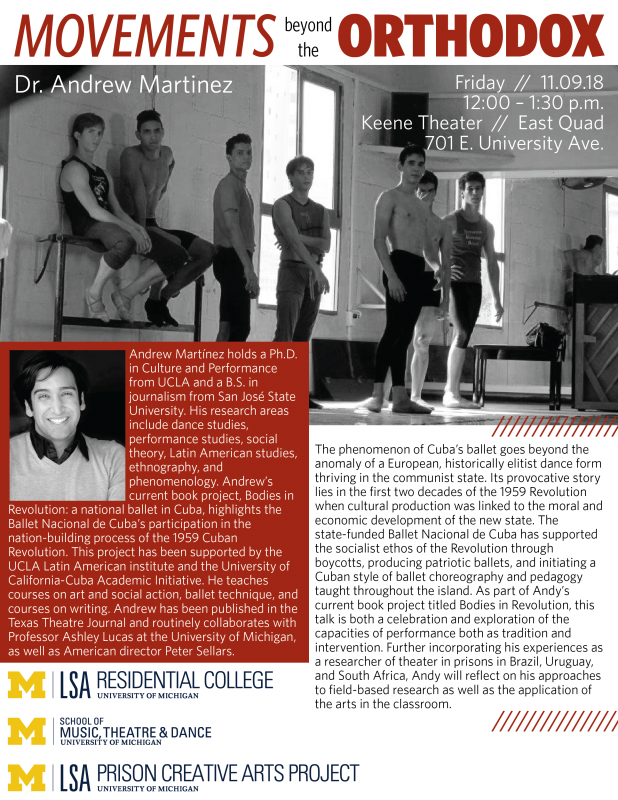 As part of Andy’s current book project titled Bodies in Revolution, this talk is both a celebration and exploration of the capacities of performance both as tradition and intervention. Further incorporating his experiences as a researcher of theater in prisons in Brazil, Uruguay, and South Africa, Andy will reflect on his approaches to field-based research as well as the application of the arts in the classroom.